Finding cheap razors and discount shaving supplies is a passion of mine. I have never been a big fan of shaving and the added cost of all these products makes it even more painful than the nick I always seem to get on my neck. My quest for saving money on shaving has gone through many phases and that includes now having a beard so I only have to shave my neck, though my Pennsylvania Dutch heritage may also play a factor into that decision. If you are tired of getting razor burn by the price of shaving needs, here are 5 ways to save money on shaving supplies. My first goal in saving money was to find cheap but high quality razors. I know that sounds like a misnomer, but I have tried generic, big name brand, and odd name brands that I have never seen a commercial for in my life. By far the best way to buy your razors locally is through the three major pharmacy chains (CVS, Rite Aid, Walgreens). All of these stores have ways to not only get the item on sale, but you can match that sale with a coupon, and then take advantage of their rewards program (free money to spend on next purchase in the store). You can usually find good coupons as a part of P&G Everyday Rewards or on Coupons.com. Get $5 back in Extrabucks when you purchase Mach 417 razor. Your total – $4.99 out of pocket and $5 back in CVS Extrabucks to use on your next trasaction. While this is a perfect scenario you can frequently get your razor and a few cartridges for $2 or less. It seems like there is a new company popping up every day that promises to ship you high quality, lower cost razor cartridges, directly to your home. There are two that you should really take careful notice of. The first has been advertising their cheap razors so well, they have become a household name and the second actually makes the razors for most of the other companies on the market. 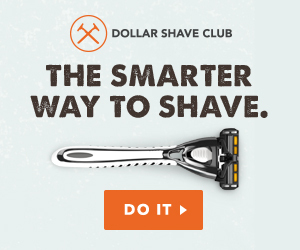 I will never forget the first ad I save from Dollar Shave Club. I instantly thought, “Those guys are going to make a lot of money.” With the average consumer spending a small fortune in razor cartridges, the idea of saving money on your razors AND having them delivered directly to your house is BRILLIANT. The only question is, is it affordable? The Humble Twin – $3 for 5 cartridges – The Humble twin razor is a two blade razor and their most basic model. They advertise it as one dollar for 5 cartridges, but this is the only razor where they charge a $2 shipping and handling fee. The 4x – $6 for 4 cartridges – The 4x is aptly named for its four blades. The Executive – $9 for 4 cartridges – The Executive boasts six blades and is less expensive than the five blade Gillette Fusion Proglide or Schick Hydro Silk. For the quality of the blade, it is the best bang for your buck. With any of the above blades you can get the first packaged shipped for $1 and no shipping and handling charge. This gives you a chance to check out the quality of their cartridge razor and see how you like them without any sort of long term commitment. What they do not tell you is that these different shave clubs do not produce their own razors. By far the main manufacture of these razors is Dorco USA. Now I don’t know who named their company Dorco, but they produce a mighty fine blade. Dorco also has a much wider variety of razors than the other mail order sites. Since they are making the razors themselves, and re-branding for other websites, it makes sense that they would have more to meet the wholesale needs of the other sellers. The best part about this is, since you are buying the razors directly from the manufacturer, you actually can purchase them for less than you would if you went through Dollar Shave Club or one of the other less well known options. The everyday prices are typically slightly more expensive than Dollar Shave Club, but they run promotions all the time. For example, as I am writing this post, Dorco cut $5.46 off their Pace 7 cartridge four pack to make it $4.99. That is a seven blade razor for just under $5. Here are the regular prices on some of their most popular razor blades. Pace 7 – $10.45 for 4 cartridges – If you want the most blades and a pivot head this is the razor for you. Only $1.45 more than the six blade razors you get at other websites. Pace 6 – $7.95 for 4 cartridges – For me, this is the best deal on the website. It is $1 less than the Executive from Dollar Shave Club and just as nice. Pace 4 – $7.15 for 4 cartridges – A nice razor for the price, but for only 80 cents more you get the Pace 6 and 80 cents less you get the Pace 3. Pace 3 – $6.35 for 4 cartridges – Built to compete directly with the Gillette Mach 3. This has been a solid seller for Dorco for years. This only happens every once in a while, but on occasion the major razor manufacturers (Gillette, Bic, etc.) will do a free sample of their razors. This is to give you the razor so you keep buying more and more cartridges, but I treat them as disposable razors (which you will find out below, last me a long time). There are a ton of places to get free samples and I cover them in my Free Sample Sites post. For years I always wondered why my razor would go dull so quickly. Having blonde hair and my beard being a mix of three types of hair (four now if you count the gray), I don’t have a particularly tough beard. So why would my razor stop working as well after just a few shaves? The answer, corrosion. Corrosion happens when metal is exposed to a combination of water and air. So shaving will naturally corrode your blades. The best thing you can do to lengthen the life of every blade you have is to make sure that it does not sit around wet for long periods of time. If you are willing to take the time, clean the blade to make sure that there is no excess hair sitting there holding moisture close to the metal. Next blow dry your razor until there is no water left and store in a dry place. If you don’t want to go to that extreme, make sure the razor is clean and then wipe down with a towel. I blow from behind the razor a few times to make sure I get all the water out. I then place my razor in a dry spot (the bottom of my bathroom drawer). With either of these methods if you submerge the razor in some baby oil it will make the blade last even longer. How much longer? I frequently have a single cartridge last six months to a year. Now I don’t shave every day but I have seen many people report that this works even with the cheapest of razors. So we have exhausted razors and move on to the final major shaving need, shaving cream. Whether you use shave cream, or gel, or foam, or whatever to lubricate the shaving process, you can use the same technique as buying the razors through the pharmacies. This will be the least expensive way to purchase name brand products. Your other option is to make the shaving cream yourself. This is HIGHLY cost effective and there are a ton of recipes out there that will do the trick. The one I found that includes products that will definitely not make your skin freak out is on Mommypotamus. Anything that has coconut oil or shae butter in it is likely to do some really nice things for your skin and this recipe has both. A wet shave with a stainless steel sharp blade leaves you with the amazing feeling of a clean shave. While I am not willing to go for the straight razor shave just yet, these methods make my hair removal ritual easier and about the same price as a Gillette disposable razor. If you have any other ways to get cheap razors or save money on shaving needs leave them in the comments or hit me up on Twitter. You, my friend, are a saving freak! What kind of razor do you use??? Bic?, Mac 3?, the new razor phone from Verizon??? Let me know, because I am sick of using this crummy old ladies razor that I keep stealing from my wife. I use a Mach3 but only because I got it as a free sample. I will post the next time you can get a free razor. Stop shaving, you’ll save even more. I just use an electric to trim up once in a while, my face and my wallet are both better off. just read an article that the worldwide razor market is $11B a year! “I have never been a big fan of shaving and the added cost of all these products makes it even more painful … ” Amen! I joined Dollar Shave Club – in fact, wrote a review on the experience … http://retirementsavvy.net/living-frugally-dollar-shave-club/ – two years ago. It is definitely a better bang for the buck than the Mach3 I used for a number of years. I use a cheap spray vegetable oil and ‘blade buddy’. Blades last at least six months with an average shave of 2x a week.